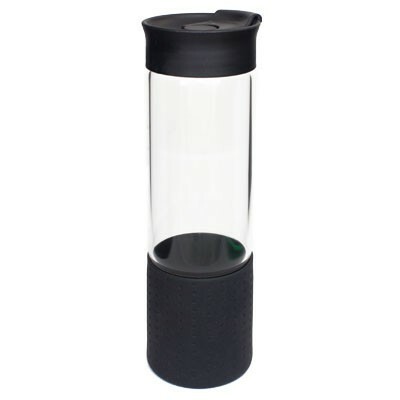 Thermo bottle will keep cold drinks cold for 24 hours and hot ones hot for 12 hours. Ergonomically designed to fit in your hand, non toxix, non-leaching, BPA free, water wont bead on the outside; hands, bags and papers stay dry. The mouth is big enough for an ice cube, small enough for drip free sipping. Polished enough for the office, tough enough for any adventure. A practical and convenient design; a glass water bottle with silicone base cover, and an easy flip top that you drink from like a sports bottle. Eco recyclable glass, healthy because there is no BPA or other toxin and the surface doesn't absorb flavours or germs. Drinks taste better in glass. This bottle makes portable hydration simpleâjust flip, bite and sip. The 750ml size fits easily in the hand the loop handle makes it easy to clip to a pack or comfortably carry in the crook of your finger. The spill-proof design, durable construction and BPA-Free materials make it an ideal bottle for work or play. 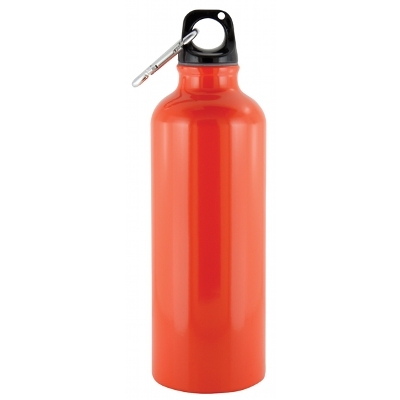 750ml Aluminum bottle lightweight with carabineer attachment. Size: 270 x 80mm Colour: Silver. Decoration Option: Pad Print | Screen Print | Engrave. Decoration Area: 100 x 30mm. 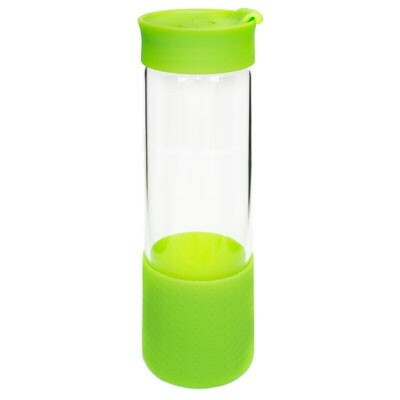 700ml BPA free sports bottle, coupled with silicone drinking or pourer top and unique screw on cup lid. This design is lightweight highly resistant to impact, fractures and extreme temperature conditions, also FDA approved. 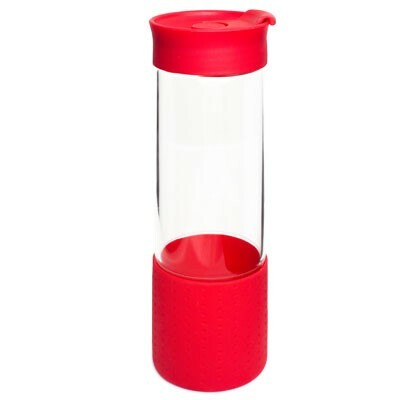 Pourer and bands can be mix and match to suit your corporate colours Packed in a white box Size: 250 x 70mm dia Colour: Clear. Decoration Option: Screen Print. Decoration Area: 70 x 35mm. 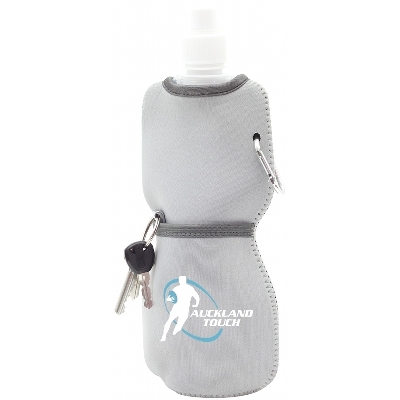 Insulating neoprene sleeve holds a refillable, reusable 480ml water bottle made from a durable PE plastic, BPA free, these bottles collapse when empty for convenient travel use. The sleeve has a mini carabiner clip and a convenient front pocket to hold key, smart phone or credit cards. Size: 120 x 270 x 45mm Colour: Grey. Decoration Option: Screen Print. Decoration Area: 70 x 70mm. 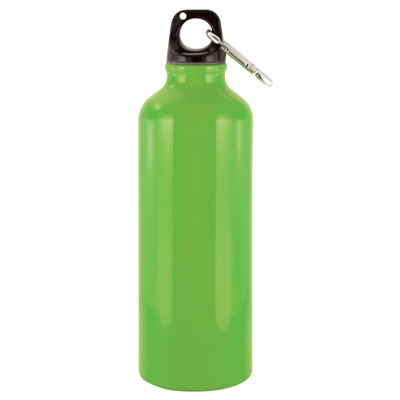 750ml aluminium bottle with contrast screw lid, pull up sipper with easy carry loop. Size: 240 x 72 mm dia Colour: Black. Decoration Option: Engrave | Screen Print. Decoration Area: Engrave 20 x 80 mm | Screen 70 x 70mm. 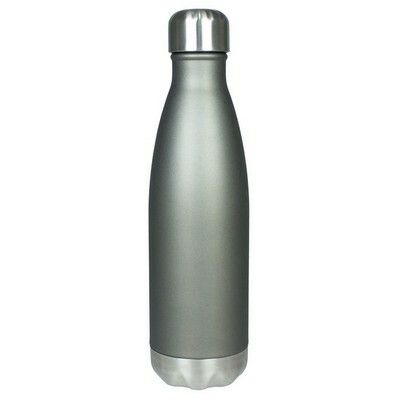 750ml aluminium bottle with contrast screw lid, pull up sipper with easy carry loop. Size: 240 x 72 mm dia Colour: Blue. Decoration Option: Engrave | Screen Print. Decoration Area: Engrave 20 x 80 mm | Screen 70 x 70mm. 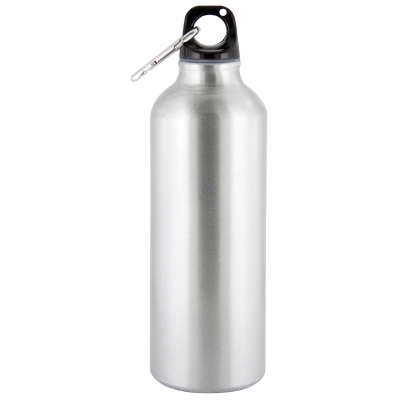 750ml aluminium bottle with contrast screw lid, pull up sipper with easy carry loop. Size: 240 x 72 mm dia Colour: Red. Decoration Option: Engrave | Screen Print. Decoration Area: Engrave 20 x 80 mm | Screen 70 x 70mm. 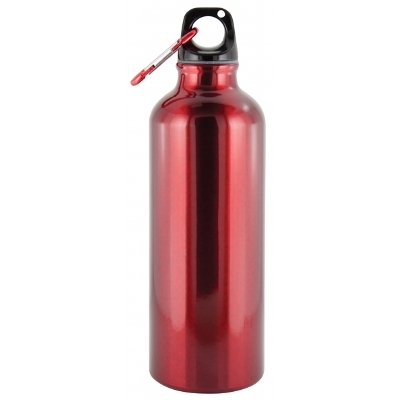 750ml aluminium bottle with contrast screw lid, pull up sipper with easy carry loop. Size: 240 x 72 mm dia Colour: Silver. Decoration Option: Engrave | Screen Print. Decoration Area: Engrave 20 x 80 mm | Screen 70 x 70mm. 2. 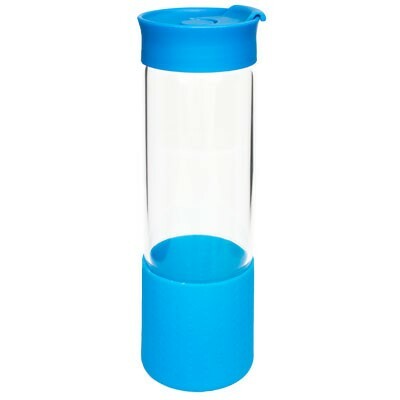 2Ltr BPA free mini water cooler bottle with handle and sipper lid. Size: 280 x 125mm dia Colour: Clear. Decoration Option: Pad Print | Sticker. Decoration Area: 40 x 40mm Pad | 60x 210mm Sticker. 2 litre lightweight sipper bottle with aluminium carabiner attachment. Size: 210 x 62mm Colour: Black. Decoration Option: Pad Print | Screen Print | Engrave. Decoration Area: 80 x 30mm Pad 110 x 75mm. 10 litre lightweight sipper bottle with aluminium carabiner attachment. Size: 210 x 62mm Colour: Green. Decoration Option: Pad Print | Screen Print | Engrave. Decoration Area: 80 x 30mm Pad 110 x 75mm. 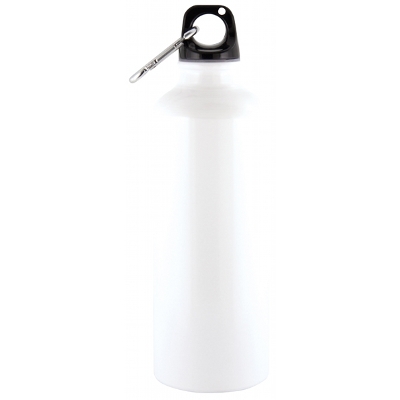 8 litre lightweight sipper bottle with aluminium carabiner attachment. Size: 210 x 62mm Colour: Orange. Decoration Option: Pad Print | Screen Print | Engrave. Decoration Area: 80 x 30mm Pad 110 x 75mm. 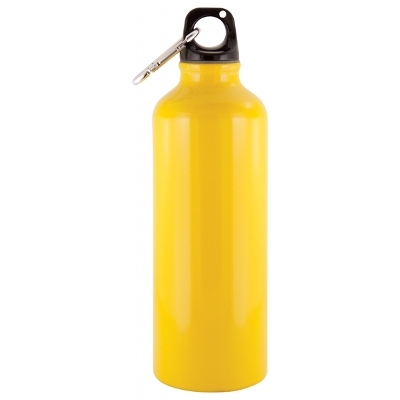 4 litre lightweight sipper bottle with aluminium carabiner attachment. Size: 210 x 62mm Colour: Red. Decoration Option: Pad Print | Screen Print | Engrave. Decoration Area: 80 x 30mm Pad 110 x 75mm. 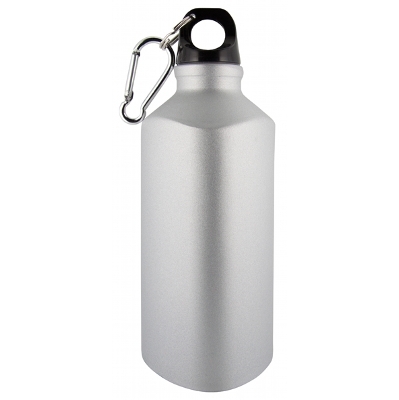 5 litre lightweight sipper bottle with aluminium carabiner attachment. Size: 210 x 62mm Colour: Silver. Decoration Option: Pad Print | Screen Print | Engrave. Decoration Area: 80 x 30mm Pad 110 x 75mm. 7 litre lightweight sipper bottle with aluminium carabiner attachment. Size: 210 x 62mm Colour: White. Decoration Option: Pad Print | Screen Print | Engrave. Decoration Area: 80 x 30mm Pad 110 x 75mm. 6 litre lightweight sipper bottle with aluminium carabiner attachment. Size: 210 x 62mm Colour: Yellow. Decoration Option: Pad Print | Screen Print | Engrave. Decoration Area: 80 x 30mm Pad 110 x 75mm. Triangular 500ml matt finish aluminium bottle with screw top lid. Size: 194 x 73mm Colour: Black. Decoration Option: Pad Print | Engrave. Decoration Area: 35 x 60mm. Triangular 500ml matt finish aluminium bottle with screw top lid. Size: 194 x 73mm Colour: Metalic. Decoration Option: Pad Print | Engrave. Decoration Area: 35 x 60mm. Triangular 500ml matt finish aluminium bottle with screw top lid. Size: 194 x 73mm Colour: Silver. Decoration Option: Pad Print | Engrave. Decoration Area: 35 x 60mm.